Landscaping professionals can also design your yard to keep it looking beautiful throughout the year. While you may love to work on your landscape during the weekends, some jobs are better left to the professionals! With chilly winter days around the corner, now is the perfect time to invest in professional landscaping for your home. Not only will professional help allow you to save time and enjoy a beautiful landscape in the spring, but it will also ensure that your landscape is healthy and lush for outdoor entertaining in 2019. Before you consider getting started on your own, consider the many reasons why you should leave your property landscaping to the professionals this season. From watering and fertilizing your lawn to pruning trees, the right equipment and knowledge can make a difference for any landscaping task. Why attempt to trim or prune trees on your own without the right tools on hand? With a professional landscaping team there to take care of your outdoor space, you can rest assured that your trees will be professionally pruned and ready to go for snowy weather next season. Landscaping professionals can also design your yard to keep it looking beautiful throughout the year. 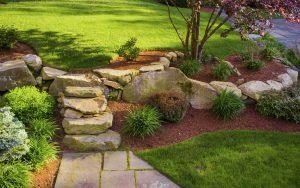 By trimming around your hardscape and incorporating various colors into a fresh layout of your outdoor space, professional landscaping services can completely revamp the look of your yard for any season. With a beautiful landscape, you can confidently entertain guests and make the most of your outdoor space in 2019. Why waste your time and money running back and forth to the hardware store all season? With a team of landscaping professionals working in your yard, your outdoor space can be transformed into a healthy and beautiful landscape design. Not only will this save you from stress, overspending, and a potential injury, but it will also streamline your budget into a direct result! Let a team of landscaping professionals such as JFK Lawn and Landscape turn your outdoor space into a beautiful landscape for you and your family to enjoy in every season next year. This entry was posted on Thursday, November 1st, 2018 at 4:34 pm. Both comments and pings are currently closed.